On October 20 local time, President Xi Jinping and his wife Mme. Peng Liyuan met in London with Prince Charles, Prince of Wales of the UK and his wife Camilla. When Xi Jinping and Peng Liyuan arrived at the Clarence House, Prince Charles and his wife greeted them in the foyer. The four enjoyed together Welsh folk songs performed with harps and had a look at paintings, sculptures and calligraphy works of Chinese overseas students in the UK. Later the two sides had warm and friendly conversations. Xi Jinping pointed out that both China and the UK are major countries with important influence and relations between the two countries have gone beyond the bilateral scope with increasing strategic significance and global influence. Over the years, the UK royal family has greatly cared for and supported the development of China-UK relations and has made important contributions in this regard, which I highly appreciate. China is ready to work with the UK to strengthen exchanges, enhance cooperation and promote the development of bilateral relations. The UK royal family members are welcomed to visit China more often. 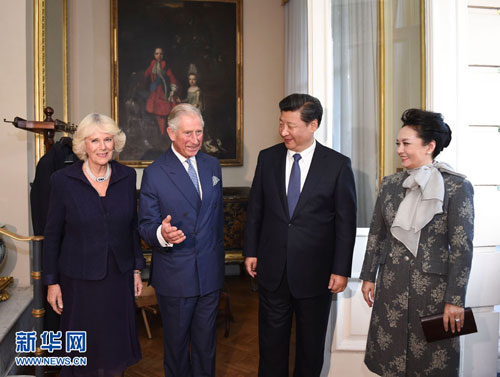 Prince Charles welcomed President Xi Jinping's state visit to the UK and expressed his hope that the visit will be a great success, promoting greater development of bilateral relations. Prince Charles said that as both the UK and China boast a long history and a splendid culture, it is of great significance to passing down the traditional cultures, and the two sides can strengthen cooperation in this respect. Xi Jinping and Prince Charles also exchanged views on topics such as sustainable development, climate change, low-carbon life and clean energy and agreed that China and the UK should strengthen cooperation in related fields.